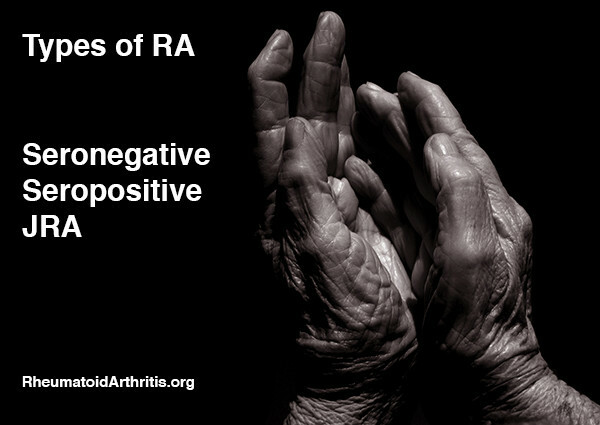 RA Types: What Distinguishes Types of Rheumatoid Arthritis? The mystery that remains surrounding the direct cause of rheumatoid arthritis makes it difficult to fully categorize the disease. Different symptoms and progression rates turn up in different patients. Though it isn’t totally clear what drives these differences, researchers do know that it largely depends on genetics. Further and further, researchers are finding ways to classify the types and sub-types of rheumatoid arthritis by the actual symptoms patients experience, in addition to other factors. Because of the progressive nature of the disease as well as its tendency to evolve over time, it may be that patients are told they have multiple types or subtypes over the course of their lives. Further research is being conducted into a deeper classification of rheumatoid arthritis into sub-types that each define unique sets of symptoms and progressions. This will help provide more personalized therapy and medical treatment options. Unfortunately, many seronegative patients may not respond to typical rheumatoid arthritis treatments. This provides further motivation for researchers to identify rheumatoid arthritis sub-types in order to provide treatment for those who don’t have any long-term solutions as of now. Whether or not a rheumatoid arthritis patient possesses the rheumatoid factor is another type or classification of the disease. Rheumatoid factor is another antibody that is used to determine the presence of the autoimmune disorder that causes rheumatoid arthritis. This is in addition to testing positive for anti-CCPs. However, rheumatoid factor can also appear in patients who have other conditions. Even infections. This is why the presence of rheumatoid factor isn’t always a firm confirmation of whether or not a patient will develop rheumatoid arthritis. Most patients who test positive for anti-CCPs, also test positive for rheumatoid factor. Juvenile rheumatoid arthritis is another type that affects patients under the age of 17 years old. It is also known as juvenile idiopathic arthritis. It is the most common type of arthritis for this age group and symptoms can be persistent. Swelling, stiffness, and joint pain can last months for those suffering from juvenile rheumatoid arthritis. Some patients may experience rheumatoid arthritis symptoms for the rest of their lives. The effects of juvenile rheumatoid arthritis differ from those seen in adult patients because children and youth can experience growth issues as a result of the disease. Eye and lymph node inflammation are also a concern. Like adult patients, juvenile rheumatoid arthritis is diagnosed from a series of different blood tests including testing for rheumatoid factor and the presence of anti-CCPs. In some cases, doctors may not be able to detect abnormalities in the blood tests of children and youth who have clinical symptoms. X –rays and scans are also performed in order to assess any other health threats like bone fractures, infections or tumors. Rheumatoid arthritis, especially in seronegative patients is often confused with osteoarthritis, which is caused by joint wear and tear as opposed to an autoimmune disease. The ambiguity surrounding which patients develop symptoms and the variation in the severity of those symptoms, has led researchers to believe that there are many types of rheumatoid arthritis. It has become increasingly difficult for physicians to diagnose a clear type of rheumatoid arthritis especially when it’s combined with other autoimmune symptoms like eye dryness or skin rashes. Physicians use symptoms, blood antibody and lab tests along with x-ray to make a diagnosis of rheumatoid arthritis. This diagnosis may be a jumping off point to try and further refine the diagnosis and adjust therapy accordingly. For this reason, researchers and physicians suspect that in the coming years we will be able to determine a variety of types and sub-types of rheumatoid arthritis that can differ right down to the molecular level. This further classification will only help to better understand and treat this chronic disease.